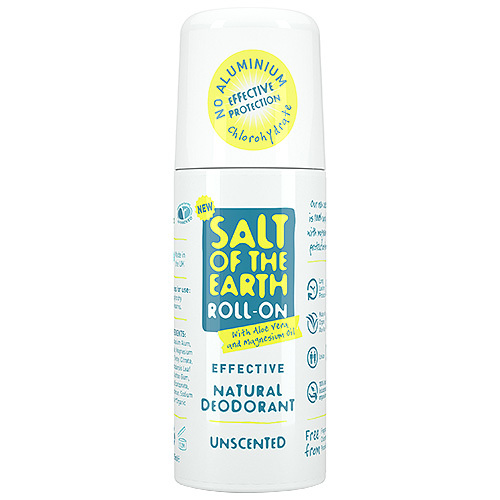 The Salt of the Earth Unscented Roll-On Deodorant provides long lasting protection with no white marks and contains aloe vera to soothe. It works by providing a thin layer of mineral salt on the skin to block odours. 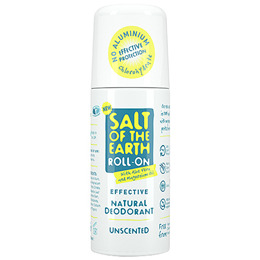 A natural alternative to conventional deodorants, the Unscented Roll-On Deodorant is made with pure potassium alum, a mineral salt which is known to be antibacterial and protects against natural odours. Aqua, Potassium Alum, Propanediol, Magnesium Chloride, Triethyl Citrate, Aloe Barbadensis Leaf Juice*, Xanthan Gum, Sodium Bicarbonate, Galactoarabinan, Sodium Anisate. Avoid contact with the eyes. In case of contact wash with copious amounts of water. Below are reviews of Salt of the Earth Unscented Roll-On Deodorant - 75ml by bodykind customers. If you have tried this product we'd love to hear what you think so please leave a review. Very good deodorant, does not irritate skin when applied. I really like it apart from one thing. The roller ball is too small! I have hair under my arms (sorry I am a man and refuse to shave) and I find that when I apply the product, the small ball traps hair and pinches....I would suggest putting a bigger ball on the bottle like standard roll on deodorants.